All the major players participating in Saturday’s “UFC 170: Rousey vs. McMann” extravaganza will be hitting the podium today inside Mandalay Bay Events Center in Las Vegas, Nevada. Stream Thursday’s pre-fight press conference live right here on 5thRound.com starting at 4PM ET/1PM PT. 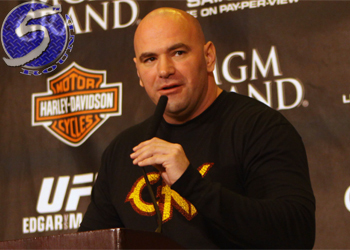 In addition to UFC President Dana White (pictured), Ronda Rousey, Sara McMann, Daniel Cormier, Patrick Cummins, Rory MacDonald and Demian Maia are expected to attend the presser. Rousey defends her bantamweight crown against McMann in Saturday night’s featured attraction. The pay-per-view broadcast begins live at 10PM ET/7PM PT.